Now to be fair, some of this was intentional: I knew the thesis 'Owl City trying to be Kanye West' would be controversial as I dug through the tangled mess of genres that comprised The Human Condition, but the more I returned to it, the more it fit. The blocky production blending, the uncanny knack for a decent tune and hook marred by lyrical ideas that would have been better left on the drawing board, the flailing attempts at certain genres that left me wondering how hard I should laugh, the contradictory religious subtext that was probably best left unexamined... but when The Human Condition worked, it was magical. The big hit might have been 'All Time Low' - a song that grew on me more than I ever would have expected - but I've found a slew of deep cuts that I revisit to this day. The biggest highlights remain 'Hand Of God' and 'Morning In America' - both songs that were among my favourites of 2016 - but 'Fashion', '80s Films', even 'He Is The Same' have all wound up on my personal playlists, and I was convinced that once Bellion managed to iron out his wildly uneven tendencies, he could make something truly great. So, sophomore album, a fair bit shorter than his last but also featuring Roc Marciano and the RZA on a song... look, Jon Bellion's stabs at hip-hop are always the most awkward and embarrassing parts of any of his projects, and I had to hope he wasn't doubling down on it, so what did we get from Glory Sound Prep? Honestly, this isn't quite what I was expecting. You would think that given the diehard fanbase he built from his full-length debut and the popular success would inspire greater ambition and risks, but the awkward thing with Glory Sound Prep is how guarded, sour and oddly conservative it feels - which yes, for a Jon Bellion project does wind up feeling more stable and consistent, but it also winds up losing some of those huge, heavenly moments that were the biggest reason I'd go back to him. 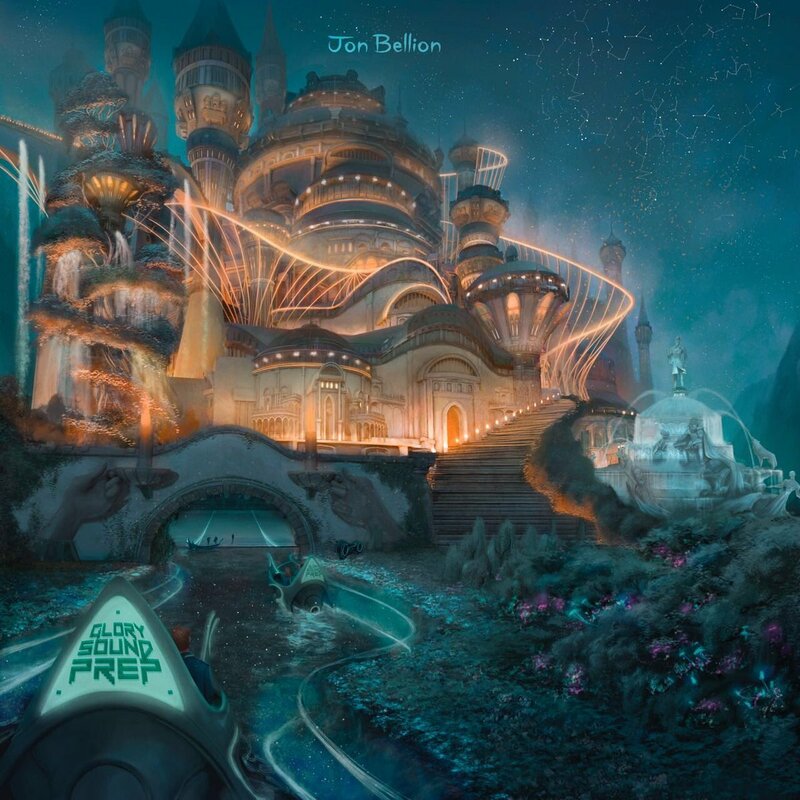 And while we get a few glimpses of that on this project, it's hard to avoid the feeling that we're getting the safe bet from Jon Bellion, which makes for a listen that's a lot less interesting. And here's the thing: I totally get why Bellion might have gone in this direction, because it places him in his comfort zone and doesn't really demand that he take a big risk, especially if he has an audience on-board who is accepting of his blocky, honking synth melodies, opulent arranged passages, and unstable beats that can occasionally hit some grand swell at the expense of any texture - one of the reasons it's so damn strange to see the RZA and Roc Marciano here, given that Bellion's production is trying to pick up New York City opulence without any of the grit. What this reminded me a lot more of, bizarrely enough, is Logic's pop rap ventures: tones that reflect a lot of smoothness with decent enough hooks, a fixation on ascendant, heavenly progressions that often wind up feeling a hell of a lot more self-satisfied than they probably should, solid but occasionally awkward flows - hell, on 'JT' we even get the Tarantino reference! The biggest difference here is that Jon Bellion leans more on religious iconography in both his singing and bars, which can feel increasingly jarring as it's delivered with the sort of blunt, reference-driven punchlines that are well-structured in their double entendres, but Bellion just sounds awkward selling them. But that might as well lead to my first quandary with this album: Jon Bellion is a fairly elastic performer, from the pop rock multi-tracked belting of a cut like 'The Internet' to the softer crooning of 'Conversations With My Wife' and 'Couples Retreat' and 'Stupid Deep', so why he defaults to the forced rhymes on 'Let's Begin' or the three-part 'Adult Swim' to ram in the bulk of his more layered content just strikes me as a misunderstanding of his strengths. And while I'm on that subject, am I the only one who thinks the lyrical nuance has taken a step back on this album as well? The power of the best songs on The Human Condition came in his very earnest approach to pop melodrama, an artist smart enough to be self-aware and realize his worst instincts, but commit to it anyway for huge anthemic moments that swung around to become awesome and resonant. Whereas here... I'd like to say the self-awareness is here, but it comes out most in the self-aggrandizing rap cuts that test my patience instead of the pop songs, which wind up feeling a lot less complex in their emotional dynamics and framing. That's not saying they're bad - the self-flagellating love songs of 'Conversations With My Wife', 'Blu' and 'Couples Retreat' aren't bad, and the closest we get to the more layered emotional dynamics does come through on 'Cautionary Tales' and especially 'JT' - although more of both songs just ride on ego - but a prime example of the change in framing comes on 'The Internet', which feels a lot like the reflexive commentary of 'Fashion' but minus the sense of populism that could make it feel relatable beyond another rant against social media. And then you get a song like 'Mah's Joint', where the self-awareness drops away completely to tell the story of his grandmother losing her memory to dementia, and how much value the memories made really have if we're just to forget them. A loaded question and I think Bellion does make the point of how those memories still shape who we are today enough to value them - the missed opportunities also comes up in the third verse of 'Adult Swim' in a decent enough way - but there's a certain irony that Bellion's songwriting on this album seems to be guarding himself against actually making those deeper memories in the first place instead of swinging for the fences. Part of this seems tied to the bizarre conflicts he forces with his own ego: trying to remain humble in the face of success but trying to shun fake humility so he can flex and keep it real, it leads to a weird messy paralysis that just feels unsatisfying as a whole, and doesn't seem to click as the self-conscious takedown as much as it should, giving you the feeling he might be better just getting out of his own head with this. Hell, he even outright retreats from making an actual political point on 'Let's Begin' that might have had some edge with themes of making memories when a system can snuff them out so quickly, but nope, can't get that real! Of course, the other problem is the sense that the production's taking fewer chances too, and outside of 'JT', I'm not sure there's a hook that comes close to matching the best of The Human Condition - and even then, 'JT' worked because of some well-placed multi-tracking against the blubbery, beeping production, more than any dramatic crescendo or swell. Oh, don't get me wrong, this album certainly tries for that - the rich cushion of strings behind Roc Marciano's verse on 'Let's Begin', the breathy choirs behind 'Stupid Deep' and 'Couples Retreat' against those faded touches of sleigh bells, the blasts of horns and that guitar surging up the bridge of 'The Internet', and the extended instrumental outro full of trumpets aided by Quincy Jones on 'Mah's Joint', but it's not like it ever hits the dramatic heights of 'Hand Of God' - admittedly a high-as-hell bar for any artist, but it's hard to avoid the feeling of anticlimax with how the song meanders. And let's not beat around the bush: even the slightly more experimental touches we do get lack cohesion, punch, and groove, consistent structural problems that remain pretty glaring here: the overmixed, blocky squonk and skitters of 'Blu' that feels cribbed from an Arca track at least before it all blurs into the hook with more arranged elements tacked on with each hook, the awkward chunky crunch of the guitars opposite the uncredited Will Smith hook of 'Cautionary Tales' that could have used some looser percussion to make that bassline work - hell, 'Adult Swim' literally feels like three different pieces mashed together with no consideration for transitions or blending! And here's the thing: I was at least willing to be a bit more forgiving with The Human Condition because it was aiming for the fences and going for broke at its best moments, like with Kanye West the awkward blockiness of the assembly could be forgiven for the insane highs. But with a more pronounced sense of reserve, the fact that these production choices remain only accentuate the stilted, awkward structure of a fair few of these songs. So as a whole... look, I'm being hard on this album, but what's frustrating is that I want Glory Sound Prep to hit a lot harder than it does. Jon Bellion is a promising songwriter with a great gift for melody and a style that can at least feel somewhat unique amidst this overpolished genre pileup, but when so many of the songs feel stifled and overthought and wind up making far less of a genuine point... look, I get some of the theme is being compromised by expectations to continue greatness, but having that play out in execution isn't exactly satisfying! It has the feel of going to a party where the host doesn't feel like he deserves to have it, and despite good moments, just feels odd for everyone else involved, which means I'm giving this a solid 6/10 and a recommendation for the fans, but I can't promise it'll hold up to the same standards of the last album, let alone the highs. Give it a listen if you're curious, but the lack of success for this project might just be what Jon Bellion needs to go forward - a sad irony if it's true, but we'll see.